When presented with modern art, how often have you said, “Oh, I could do that.”? If your answer is yes, then artist Thomas Prinz offers you an opportunity. In his current exhibition, organized by the Moving Gallery in the Garden of the Zodiac, Prinz has added a kind of sandbox for kids, never mind how old, to tear, crinkle, accordion fold, twist and curl paper of all kinds, literally a chance to deconstruct and reconstruct personal creations. Prinz’s own creations feature paper assemblage and printed works, on display through January 15, and reflects his ongoing fascination with materials, technology and process and his self-directed journey as artist. At first glance, much of the work appears unrefined, shabby chic, even chaotic. Most of the works, unconfined to a clear geometric template, are composed of vertical strips made of digitized images, painted paper, colored paper, tissue paper and Mylar. While they are close to rectangular, many pieces feel like spontaneous, fluid, mostly abstract constructions. On the floor sit several three-dimensional paper sculptures that remain unexplained either in the List of Works or on the wall. They appear random and disconnected to the exhibit. So far, it all looks like child’s play. You’re feeling pretty confident you could do this. But look again. Check your emotional response to the colors, the vertical lines, the subtle printed surfaces below the overlays. Consider “PRV 17,” a large wall piece, balanced on either side by two-foot wide panels of printed underlay covered with stitched tissue paper. Horizontal lines on one side and vertical lines on the opposite give contrast to the colorful strips of paper that center the ‘canvas.’ Pastel strips of duck fuzz yellow and robin egg blue get whitewashed with transparent Mylar strips akin to wax paper. Machine stitching, meant to attach the strips to the whole, also directs the eye to new discoveries as it crawls over the surface. You’re beginning to wonder how he gets this large work, maybe two inches thick in places, through a sewing machine. Did he photograph all those underlays? Your confidence in creating paper collage is waning. 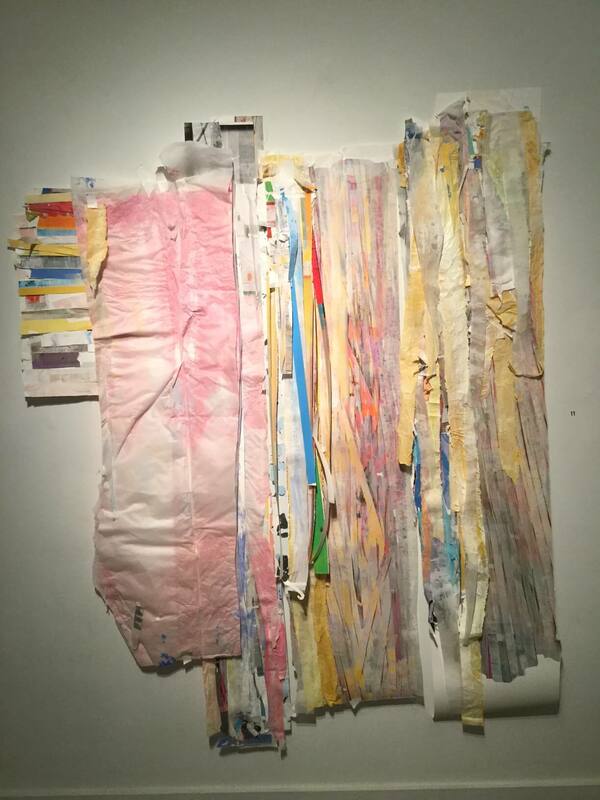 Another type of assemblage, an “Untitled Number 11,” sports a large splotch of mottled pink with yellow, greys, Mylar white, and bits of bright blue and green. Its vertical center strips float freely, much like kite tails in the wind. To its left, a mini canvas of horizontal brightly colored strips looks like a room addition to this otherwise patchwork house. At this point you may be having doubts about your sense of design, your ability to conceive of this level of juxtaposition, the mix of materials, the directionality, and the color palettes. Thinking less color might demand less skill, you discover a collage of Nike, the headless winged sculpture of the Greek goddess of victory from the 2nd century BCE. 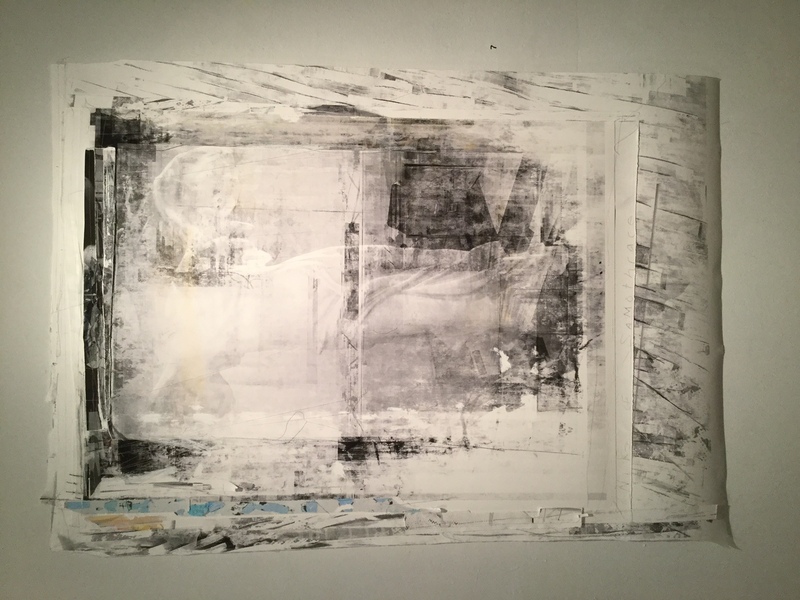 Entitled “Winged Victory,” Prinz shrouds the subject of his work with a transparent curtain, then frames it with hints of Doric columns and a lintel made of cut strips of black, white and grey printed papers. An added frame of diagonal strips, black and white touched with blue and ecru, create motion around the work. Notes to self: are the prints of one subject or are they layered images? Are those really eyes hiding in the wing? Time to play Where’s Waldo in a hunt for hidden symbols! His architectural sensibilities taught him to appreciate the layering of planes and materials in unfinished buildings, and that multiplicity of layers and materials can be seen in his work. A truly hybrid artist, Prinz hopes to meld the processes of different ages: ancient, by hand; modern, by using industrial sewing machines; and post-modern, by engaging digital technology. By the way, his personal sandbox is a well-lit studio at the Mastercraft building. His process may start with an enlarged or diminished printed photo, maybe with a painting, or a photograph of a painting, or maybe both. Either could stand alone as a finished work, and in fact, some do. Yet, his appreciation for the accidental moves him to tear his original works apart and assemble something new. A visitor to the show, Joe Liebentritt, recognized Prinz’s efforts and praised his courage to reimagine and reassemble original works in a highly textured and somewhat amusing way. Prinz uses his muses as different sources of energy in his work. Like Jackson Pollock who used his whole body in pouring, splattering, and dripping, Prinz, too, strives for a total body engagement: painting, printing, tearing, sewing, assembling. He references Howard Hodgkin for his sense of scale, color, and beauty; Cy Twombly for his imperfection and audacity; John Cage for his intellectual rigor. Materials are Prinz’s touch points and his mainstays. Expect new varieties of them in the future. So do you think you can still do it? Of course you can. Just hop in the sandbox. Everyone should have one! Thomas Prinz continues at the Garden of the Zodiac Gallery in the Old Market Passageway through Jan. 15, 2017. For details and hours call 402) 341-1877.